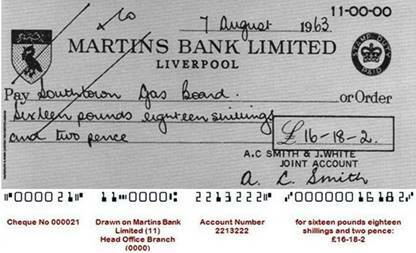 In 1963 some Martins’ machine room staff in Liverpool and London make the change from listing items on mechanical adding machines and statement printers, to using the latest encoding machines to print, in magnetic ink, a monetary value along the bottom of each cheque. 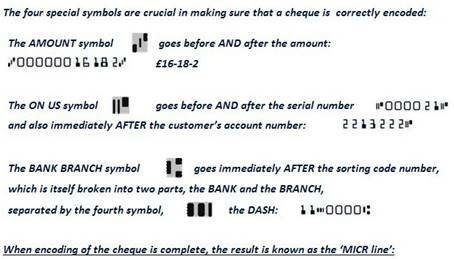 Together with other information already printed on the cheque, such as a serial number, the sorting code number that identifies a particular branch of Martins, and most importantly an account number, the cheque is thus equipped to be read and sorted by machine, enabling funds to be quickly removed from a customer’s balance. The allocation of account numbers is met with some resistance by customers who feel that banking will become impersonal – up to this point not even the customer’s name has been printed on a cheque, and staff have to rely solely on recognising and comparing a customer’s signature with branch records! A sophisticated system of account numbers involving a complex mathematical check of the account number against the sorting code, has been developed for all banks, and this effectively prevents the customer from being debited for a transaction that isn’t theirs. 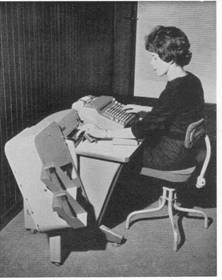 National Cash Register Company (NCR) encoding machine. The principles of electronic reading, showing how characters printed in magnetic ink are sensed and interpreted. 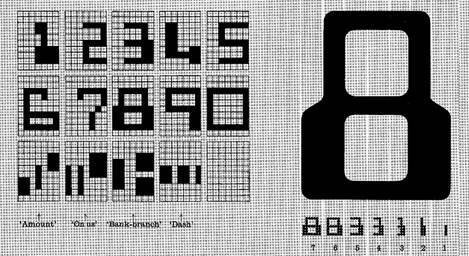 70 “blocks” are scanned by powerful logic circuits to interpret each of the 14 permitted characters in the E13B typeface. The multi-channel reading head of the IBM READER/SORTER machine breaks up the characters into 10 horizontal elements. Seven separate readings are made as the character passes under the reading head, so that each numeral or special character is divided into 70 blocks, or sensing areas. The presence or absence of magnetic ink in each of these sensing areas is recorded in an electronic register, which therefore builds up an image of the printed character. Powerful logic circuits compare this image with the perfect character, and with the thousands of permitted variations. Some variation is inevitable, and the machine’s usefulness would be very limited if only perfect reproductions were accepted. It therefore rejects only those images in the electronic register which could be related to more than one of the 14 possible characters. The characters which make up the E13B typeface have been carefully designed after exhaustive analyses of comparative shapes. Each is as different as possible from all the others, yet retains its legibility for the human reader.